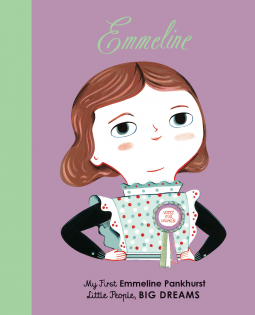 Let’s hear it for women, for little girls: My First Emmeline Pankhurst – Joyce's mystery and fiction book reviews with some non-fiction too! This board book is part of a series that is an offshoot of the Little People, Big Dreams books which are written for slightly older children. As they hear this story, young listeners will get a beginning understanding of British women’s fight for their rights, especially the right to vote. Children will learn that, as a young girl, Emmeline realized that boys had opportunities that she lacked. They will find out that she decided to do something about this and became a fervent supporter of women’s suffrage. Here is Emmeline’s story and that of her family. It is told in a simple straightforward manner. The illustrations that accompany the text are bright, bold and appealing as they complement the written narrative. Thanks to NetGalley and the publisher for this one. It will teach young children about their amazing right to vote and women’s equality. I love this series of books so much! I do too! I have reviewed a number of them. I am so excited every time I hear about a new one.